A Republican donor is aiming to influence Ohio’s competitive Democratic primary for governor by attacking the establishment’s preferred candidate — from the left. Restauranteur Thomas “Tony” George is behind the nonprofit Citizens Policy Institute, which has produced a 30-second television ad blasting Richard Cordray, the state’s former attorney general and the former head of the US Consumer Financial Protection Bureau. “Why do Republicans like Rich Cordray so much?” a voiceover asks in the spot, which was first reported by Politico. “He has an A+ rating from the NRA. And he hurt consumers by quitting his job as America's consumer watchdog so Trump could appoint his replacement." The Republican behind the ad "also acknowledged he has been friendly with Dennis Kucinich", the article notes. Democratic gubernatorial candidate Dennis Kucinich released part of his recent income tax information Monday, but an opponent said it was too little, too late. Two of the other main four candidates in the Democratic field — state Sen. Joe Schiavoni of Boardman and Richard Cordray of Grove City — last week made available copies of their last three years’ tax returns, complete with schedules showing deductions and sources of income. Former state Supreme Court Justice Bill O’Neill released last year’s taxes, saying the two previous years were similar. Kucinich’s spokesman said he’s requested an extension to file a return for 2017 and on Monday, his campaign emailed only the first two pages of his 2016 and 2015 returns, making it impossible to know from where he and his wife have received their income. Kucinich’s spokesman, Andy Juniewicz, noted that Cordray’s campaign hadn’t distributed copies of his returns to reporters, instead making them available for inspection at his Columbus headquarters. The Dispatch would have to go to Cleveland to see the rest of Kucinich’s returns, Juniewicz said. I want to know how much he was paid by Fox News, RT, and pro-Asssad groups. By the way, Kucinich was in RT Sunday talking to Larry King. 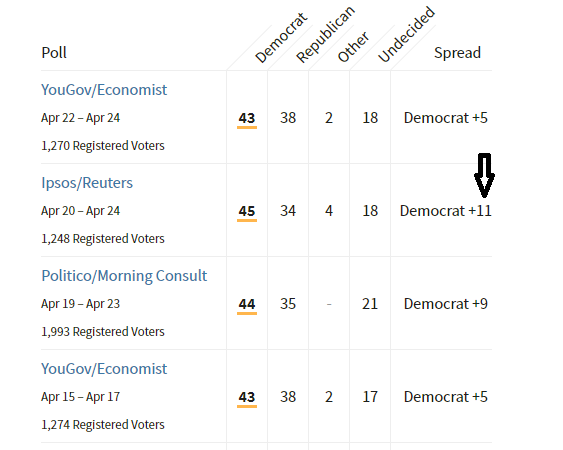 Pundits today are going gaga over a Reuters/Ipsos poll pretending that millenial support for Democrats is "waning". But the same pollster gives Democrats the largest lead of any pollster (11%) over the GOP ahead of the midterms, a lead way larger than what's needed to retake the House majority. Analysts say Democrats need about a 6% lead to gain a House majority. This 11% lead should be among the top news in every newspaper and political website. But they go with the anti-Democratic line because it's the mainstream media we're talking about. There are LOTS of way to go after Sanders. I personally think that she is overly antagonistic to the reporters who cover the White House and misleads on the regular. But to make fun of Sanders' makeup? ("I think she's very resourceful, like she burns facts and then she uses that ash to create a perfect smokey eye. Maybe she's born with it, maybe it's lies," said Wolf.) Like, really? I know lots of liberals will -- and already have via Twitter -- painted the attacks on Sanders as the press secretary getting what she deserved. I don't subscribe to that idea. Sanders showed up, sat on the dais and played along. She knew she was likely to get made fun of. But she would have no reasonable expectation that Wolf would go after her looks and refer to her as an "Uncle Tom, but for white women who disappoint other white women." Former U.S. Rep. Dennis Kucinich, a Democrat running for governor, said on Thursday he is returning a $20,000 speaking fee he received from a group sympathetic to the Syrian government. Kucinich initially failed to disclose in state ethics filings that he received $20,000 in 2017 for a paid speech in London from the Association for Investment in Popular Action Committees , which includes the pro-President Bashar Assad group Syria Solidarity Movement. Kucinich received widespread criticism, including from former Gov. Ted Strickland , though some voters seemed unconcerned .